Croatia is another of the countries we’ve visited lately that has a very interesting, very recent history. Croatia declared independence from Yugoslavia in 1991, and it took four years of sporadic, bloody warfare before the Serb-dominated Yugoslav army finally left Croatian lands. 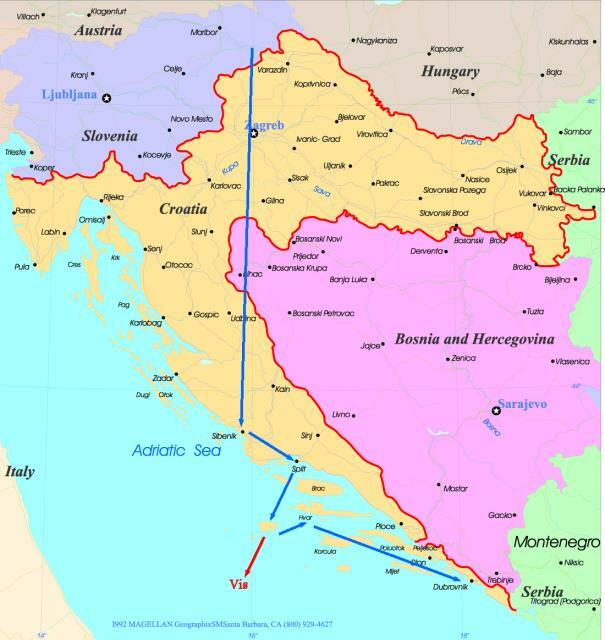 The conflict resulted in the mass exodus of Croatian Serbs, whom had lived in Croatia for centuries. Most of them have not yet returned to Croatia. Tourists, however, have since come to Croatia in droves. Dubrovnik, its most popular destination, is now a popular stop for cruise ships, so it’s filled with sidewalk-clogging tour groups from about 10:00 a.m., when the ships dock, until 5:00 p.m., when they finally set sail. But where there are lots of tourists, there are usually amazing things to see, and Dubrovnik is no exception. The town, with its cobblestone streets and terracotta roofs, is breath-taking. What’s more, Croatia’s islands are postcard-perfect. The smaller ones, like Vis, are still slightly off the main tourist track. In their tiny, waterfront towns, it is still possible to get a sense of what life was like before the tourist deluge began. The more popular islands, like Hvar, boast an incredible nightlife that has been enjoyed by the likes of the Hilton sisters. It’s important to note, too, that we were here in the high season. Had we arrived in the low or even the shoulder season, we know our experience would have been different and, most likely, more authentic. As it was, though, it was still wonderful. We’ll definitely be back to this gorgeous country. Pansion Petricevic (July 9-10, 2008): We happened upon this place when we drove into Sibenik late at night with no reservations and no knowledge of the local hotels. At about $60, it was far cheaper than any of the other places in town that we checked out, and it was certainly servicable. One big bonus: our balcony looked out over the sea! Private Apartment/Sobe (July 10-11, 2008): Affordable housing options in Split during the high season are few and far between, which explains how we ended up here. At $100, it sounds expensive, but it was by far the cheapest option that we came across. It certainly wasn’t fancy, and the bathroom was down the hall rather than in the room, but it met our needs. Aboard our yacht, the Jolly, skippered by Damir (July 11-14, 2008): Ahh, if only the bedrooms had A/C or even fans, this yacht would have been utopia. As it was, some of us ended up sleeping on deck in an attempt to beat the heat. The boat itself was lovely, though. Only a couple of years old, and such a luxury for us. Apartments Pavisa (July 14-18, 2008): In Croatia, most of the best (and cheapest) housing is private, i.e., in houses or apartments owned by people who rent out rooms. Our stay at Apartments Pavisa was pretty much the best private-housing scenario imaginable. We had a private apartment in a small building that was less than a block from the heart of Dubrovnik’s old town, and it was clean, comfortable and, at about $90 a night, very affordable given the area and the season. The best thing of all was the proprietor, Pero. He was so genuinely kind, friendly and helpful that it was like having a friend in town. We’d definitely recommend this place. Restoran Pizzeria: This Italian restaurant was right below our pension, so eating here was incredibly convenient. Shanna’s squid ink risotto (a Croatian specialty) was just ok, but Derek is still waxing poetic about the salami pizza he had here. Sperun: Actor John Lithgow (of Third Rock from the Sun fame) was eating here with his wife when we walked in, so it must be good, right? In fact, the Pag cheese (a salty, sheep’s milk cheese made on the Croatian island of Pag), sea bass and mussels risotto we had here were pretty darn good. Stellon: This waterfront place in Split was fairly affordable, and its pastas and pizzas were pretty tasty. Konoba Bako in Komiza: The view here (right on the harbor, looking out over the boats bobbing on the water) was so good that it almost made up for the high prices and mediocre food. But not quite. Potentially Nameless Pizza Place in Komiza: Really nice pizza at picnic tables right on the water–good stuff. Potentially Nameless Sandwich Shop on Hvar: the wraps and sandwiches we had at this little shop were decent and, for Hvar, fairly affordable. Dundo Maroje: This place in the heart of Old Town looked like it would be just another medicore tourist joint, but it was great! We loved our shrimp risotto and fish stew (which came with delicious polenta). It was also pretty cheap, given the area. Fresh: This wrap-and-smoothie place was one of the few backpackery-type spots in Dubrovnik’s Old Town. Our Mexican burritos were tasty and cheap, and Fresh has free wifi, which is always wonderful. Buffet Kamenice: This is one of the most popular restaurants in Old Town; people waited in line for it while tables at other restaurants nearby sat empty. We started with a octopus salad, which was pretty good, and moved on to tasty spaghetti and a huge plate of delicious mussels, the latter of which were a great value. Oliva Pizzeria: We really liked this place, not least because of our friendly server, who didn’t seem to mind that we sat there for hours after we finished our pizza and greek salad (which were both great), taking advantage of their free wifi. The Gaffe Irish Pub: The cheeseburger at this “Irish pub” was pretty bad, but the black-bean burger was tasty. We would like to thank the following individuals who gave us a wedding gift that we used in this country: Sue & Ed Jackson and Mark & Deb Arduino. We really appreciate it!